The positions below are based on candidates’ answers to questionnaires and to questions asked at candidate fora and on other public statements from the candidates. * While the candidate currently holds that position, s/he might consider voting differently.
? The candidate has not indicated their position on this issue. In the last week there have been two poorly-advertised and poorly-attended Mayoral and City Council candidate fora in San Leandro. Mike Katz-Lacabe tweeted from the Mayoral fora. He’s running for City Council himself, so he couldn’t report on that part of the fora, though he did note some of the “lightening questions” from the first forum. Update: See also responses to the APA Caucus questionnaire below. All San Leandro City Council candidates favored a marina with small boats – in other words, no support for paying to dredge the channel. All San Leandro City Council candidates say they support marijuana dispensary except Lee Thomas. All San Leandro City Council candidates support ranked choice voting except Dist. 1 candidates David Anderson & Deborah Cox. Dan Dillman says San Leandro’s pressing problem is perception. It’s a beautiful city. Pauline Cutter says San Leandro’s most pressing problem is economics. Diana Souza says San Leandro’s most pressing problem are the streets. (The street conditions decreased every year she’s been a Councilmember). San Leandro mayor candidate Souza asks for other candidates’ views on rent stabilization. Cutter: we need to consider. Dillman: what voters want. San Leandro mayoral candidates on city staffing: Souza & Cutter: more cops. Dillman: use police from CHP, BART, Sheriff, Parks. San Leandro mayoral candidate Diana Souza says working poor can be helped by recreational programs for youth, seniors and adults. Breaking news: All San Leandro mayoral candidates support transparency at City Hall. Cutter & Dillman mention improving meeting minutes. San Leandro mayoral candidates on red light cameras: Cutter and Dillman oppose. Souza supports. Thinks they save lives. San Leandro mayor candidates on SLPD acquisition of armored personnel carrier: Dillman opposed, Cutter researching, Souza supports. San Leandro mayor candidates on Measure HH: (sales tax increase for 30 years) Dillman opposed to length. Cutter & Souza support HH. San Leandro Mayoral candidates on whether they support marijuana dispensary: Cutter and Dillman: yes; Souza: No. San Leandro Mayoral candidates on flying the flag of other countries: Cutter says no, Souza says yes, and Dillman says: whatever voters want. Note: During the interviews for the Democratic Party endorsement, Souza and Cutter clarified that they are in favor of surveillance cameras, just not throughout the city. We the People of the Bay Area and Alameda support Human Rights and do not want Alameda to be tainted by the political event, namely, to raise the Flag of the People’s Republic of China on October 1, 2013, which is China’s National Day, at Alameda City Hall. China’s illegally occupied Tibet in 1949/50 and over one million Tibetans have died resisting the Chinese flag. Tibetans deserve liberty and justice and wish to stop living under the Chinese police state, which severely oppresses Chinese, Uighurs, and the Tibetan people. We demand more transparency and accountability to democracy so that Alamedans & the public know about this flag-raising endorsement of China’s dark human rights record. Recently, 122 Tibetans lost their lives by self-immolation to urge the public to help Free Tibet and Return the Dalai Lama home to Tibet. The public should know the true meaning of the raising of the Flag of the People’s Republic of China. Alameda will NOT Raise Chinese Flag on October 1st. San Leandro City Council member Benny Lee argued that San Leandro should raise the flag of the People’s Republic of China at City Hall because other cities like “Alameda do it”. It turns out that that is not true. 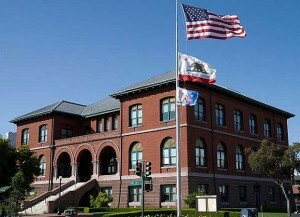 Please be informed that the City of Alameda, California, has not, does not, and will not raise a foreign national flag on City Hall’s flagstaff. The flag-raising ceremony scheduled next week is sponsored by our local Sister City Association and the Alameda Wuxi Friendship Committee, who use their own portable flagpoles. This event is not a formal City Hall event; the Mayor and City Council do not sponsor it; they do not vote on it; they do not fund it. So it would appear that Mr. Lee was, to put it politely, less than truthful. San Leandro is Leading the Way – Don’t Forget to Rank Your Vote! San Leandro Resident on Nancy O’Malley Lets Cops Get Away with Murder. Literally.